Many people with disabilities wait years before they are determined to be eligible for benefits. PASS plans,1619b, Medicaid Buy-In for Working people with a disability and some of the other underused mechanisms that will be covered. These free OMH workshops will show you the benefits and advantages by participating in Social Security entitlement programs. These workshops will also teach you how to request a waiver for an overpayment; avoid spend-downs; use Social Security work incentives to help maintain SSI and SSDI eligibility as you explore returning to work; ease off cash benefits and into self-sufficiency; work full-time and maintain low cost (or even no-cost) health insurance; get expedited reinstatement of benefits. The Official Career Development Source for Employment, Training and Recruitment issues for Business and Individuals in Chenango, Delaware and Otsego Counties of New York State. Post your company's job openings at no charge with CDO Workforce and get exposure to many job seekers. Your job will be posted to America's Job Exchange, http://www.laborny.jobs. Contact us today!! Businesses - Save money and time by outsourcing your recruitment needs to CDO Workforce. Our Career Center staff provides employers with convenient, no-cost recruitment services by connecting job seekers and employers. What We Can Do for You: Match job seekers with job openings. Coordinate communication between you, our partner agencies, and the pool of local, qualified workers. Provide interview space at the Career Center if you wish to recruit on-site. Provide targeted or general job fair recruitment opportunities. Post your company's job openings at no charge with CDO Workforce and get exposure to many job seekers. Your job will be posted to America's Job Exchange, http://www.laborny.jobs/ . Veterans Come First! 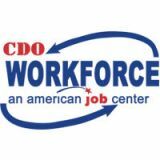 CDO Workforce New York Career System is proud to offer Priority of Service to veterans and their eligible spouses.